Intolerance, aggressiveness and seclusion, as a rule, are manifestations of a “low cultural level,” Medvedev has said. “All Nazis, regardless of the place of their origin, are anti-national in their nature,” the president stressed at the meeting with the heads of both chambers of the Russian Parliament on Monday. 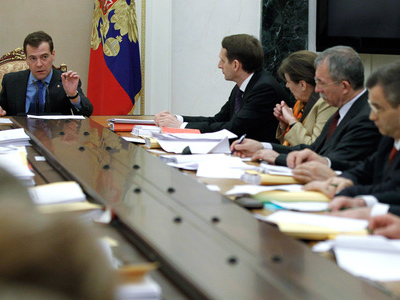 Nazis simply undermine the foundations of the development of their states, Medvedev noted. In fact, they “destroy everything, including their own ethnic group, for which they allegedly fight.” He cited, as an example, fascist Germany where Nazism, in the end, damaged the country itself. The authorities should pay special attention to the Russian culture and language, Medvedev stressed, warning against forgetting them. “It is the basis, the core of the development of our multinational culture,” the president said. “So, it is not shameful to speak about it,” he added. The Russian tradition and character probably manifest themselves in this, Medvedev noted. At the same time, the state should develop an effective policy not only towards traditional, but also modern Russian culture, the president said. Modern Russian folklore, music and literature needs to be supported, he stressed. Keeping society peaceful in Russia must take place without setting up new bureaucratic structures like a Ministry for Nationalities, the president said. The ethnic peace in the country must be maintained by the state, together with the general public and business circles, he noted. “Our economic, social and political objectives are very multi-dimensional and very complicated, but there is no doubt that they can be solved and there is one condition for it, but this is a key condition – civil peace. We need inter-ethnic conciliation, mutual agreement, understanding and the solidarity of all Russia’s nations,” the Russian president stressed. He also said that this work must be accomplished by existing government structures, without setting up new bureaucratic institutions. “The attempts to set up new bureaucratic structures like a Ministry for Nationalities have never solved these tasks before. We need thorough work of the deputies, civil servants, public figures, business representatives and the whole of civil society to support the interethnic accord,” he said. The Ministry for Nationalities existed in the Soviet Unionfrom the foundation of that state. The Russian Federation maintained it until 2001, when the ministry was dissolved and all its functions passed to the Ministry of Foreign Affairs.